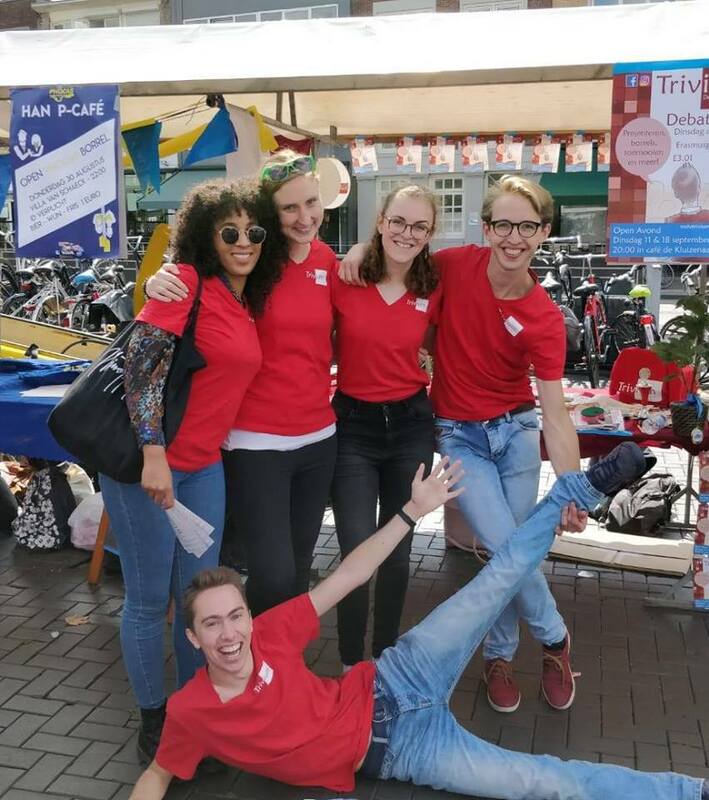 An influx of new debaters is crucial for the debating community in the Netherlands to thrive. As we have seen a general decline in participation of debating tournaments, as well as many debating societies indicating they are increasingly struggling to find new members, the Debatbond focused on how to get new members in the last board day. In addition, quite some societies autonomously organized sharing groups, so that best practises could be copied. A good opportunity for 720 to reflect on what societies have changed in their promotion plans this year and how successful they were. In writing this article, I reached out to a couple of societies in the Netherlands to ask them about their introduction period. What stroke me in the responses I received was their general positivity. Most, if not all, societies were quite optimistic about the new member base and satisfied with their efforts in promoting. For instance, Bonaparte achieved an above-average member growth of over 20 new members this year. EDS was also quite content with their growth and the general interest in their societies, with both introductory workshops being attended by roughly 70 people. Moreover, societies felt they put a lot of time in their promotion efforts. Cicero mentioned how their chair missed most of his lectures in the first three weeks because he was so busy with spreading the debating message, whereas Leiden also felt they spent ‘a lot of their time’ on promotion in the first weeks of their board year. So far, an optimistic view on the new influx in Dutch debating arises. However, when looking at the participant numbers for the tournaments so far, one might question, at least, the participation of the new members in debating tournaments. Roosevelt Open, UCU Open, Trivium and Cicero all struggled with attracting the kind of numbers they did in the past. Striking was furthermore that UCU Open had to implement a Pro-Am final instead of a novice final due to the lack of novice teams. Given that tournament participation is quite a good proxy for society participation, I think it is important to be wary of these trends. This brings me to the larger point of this article. The importance of introduction weeks for societies and Dutch debating in general is rather unquestioned I think. And although I am glad to here the success stories of societies, I think it is also important to be critical of what societies do well and what they can improve on. To start off positive, I think one of the best examples of a positive change made by a society this year is the change to being more inclusive and accommodating to international students by Bonaparte. They consciously reached out more to international students and tailored (part of) their message accordingly. As a result, Bonaparte was able to attract a far larger number of international students than last year. Another positive marketing example is the society positioning of EDS, that specifically highlight themselves as one of the few societies in Rotterdam where English is the first language. By effectively comparing themselves to other societies, they cater clearly to a specific set of needs by a rather large student group in Rotterdam – and quite effectively so indeed. Lastly, I think many societies did think carefully about some of the comparative advantages of debating societies, in the sense that many indicate to highlight the benefits of debating on personal development, developing skills that are relevant in the workplace and within academia, etc. There is also room for improvement of course. Perhaps most importantly, I think that societies should be more critical about their marketing strategy and tactics. Formal evaluations of marketing efforts are not as thoroughly and often done by societies as one might hope. Many boards indicate they largely copied the marketing strategy that was followed in previous years, perhaps tweaking little things here and there. Although this is not necessarily a problem, it is easy to not innovate enough and improve the marketing strategy. Furthermore, societies do not always have a clear idea of who they want to reach. Whereas some target international students specifically, others focus on particular sets of students (such as philosophy, economics or politics), or just on first-year students in general. I think that being aware of who you want to reach is vital in understanding how to convince them. Of course, societies shouldn’t just focus on one group (such as international students), but their ways of reaching out to these groups can be different in order to achieve more success. When starting a Facebook campaign, you need to have a clear idea about who to target and why the campaign is effective. Many boards, my own board included two years ago, start Facebook campaigns, or similar marketing tactics, merely because it seems hip and new. Carefully thinking about which channels are effective is an important continuation of identifying the target market. Lastly, my last observation is that many boards intensify their marketing efforts on the beginning of the year, but don’t specifically continue working on marketing throughout the year. I think that having a marketing plan that goes beyond the introduction period will force boards to be consistent in their messaging and increase chances of attracting members throughout the year. Improving marketing is important for societies, and I think it is particularly a topic on which we can learn a lot from each other. The increasing exchange of best practises at Board Days or via Facebook is very useful for that very reason and I hope this will continue. For any other input or questions on marketing efforts, the Debatbond is of course very much willing to help you with any queries you might have!